S1: E9 – Neo Ve’ave’a ANNOUNCEMENT – Radio for the People, by the People. Faika Family, it’s ANNOUNCEMENT TIME! Brought to you by PolyByDesign, the Faika Podcast will give you EXCLUSIVE access to the ANNOUNCEMENT that has been rumbling for months. Where do you hear it first? On FCCFREERADIO.COM in the iconic Studio 2b from 10:00 to 12:00 Noon THIS SUNDAY!! 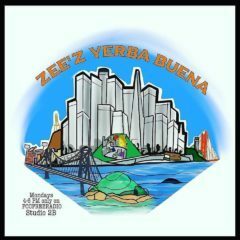 Community activist and “Champion for a Better San Francisco” Neo Ve’ve’a will be both our in-studio guest and our full episode co-host. Come get to know the man who has worked in 5 different decades to make our City By The Bay a better place for all groups. There are too many programs and endeavors to list that Neo has served as either a founder, a driving force or a participant in over the years but in the 2 hours of the Faika podcast we will get to know who he is and what makes him tick. Topics that will be on the table will be the nail-biter Rugby League World Cup semi-finals matchup between Tonga and England. This match came down to the wire and ended in controversy. We will talk about the wild wild west aspect of the spectacle that has become “Black Friday”. Teen Vogue columnist Emily Lindin took the PREPOSTEROUS position that she didn’t care if innocent men were punished in the fallout of #metoo. Even if they lost their jobs and had their lives wrongly uprooted, she said “this is a price I’m willing to pay”. This “scorched earth” social justice gets Faika’d on Sunday. Did you know that the only American Territory that doesn’t grant citizenship to it’s people upon birth is American Samoa? That will be in the Faika Crosshairs. 2 Responses to "S1: E9 – Neo Ve’ave’a ANNOUNCEMENT"
I loved your interview with Neo Ve’ave’a & how he spoke about the changes throughout the Bay Area especially when he spoke of the Planters’ Peanut Company & the meat packing houses in the Bayview, I lived there in the mid 60’s I lived in Hunters Point right when the integration of the schools happened. Good Luck Ne’o on your run for Supervisor! Thank you Lillian. Neo is a special man who has done a lot for all types of people and communities over a five decade span. He is home-grown San Francisco and has been giving groups and organizations a stronger “voice” his whole adult life. Now his goal is to give the people and communities within District 10 a bigger voice on the City of San Francisco stage and beyond. We at the Faika podcast were honored to have him make his candidacy announcement on the show and we will do all we can to support his journey. Thank you for your kind words and have a wonderful Holiday Season.